A lot has been made in the conservative press of President Obama’s reportedly “failed” administration. More noise has been made by progressives in a similar, though more helpful vein. Both sides point to Tuesday’s nearly 5% drop in the Dow Jones after Treasury Secretary Tim Geithner’s brief introduction to the bank rescue program. But after less than 20 trading days on the job, has Obama really failed to do the job? What about the track record of other Presidents who inherited difficult economic circumstances? Our chart for this week is a comparison of the Dow in the first year of the administrations of Franklin Delano Roosevelt (FDR), Ronald Reagan, Bill Clinton and the first 17 trading days of Barack Obama. You’ll be surprised to see who was really the market guru. 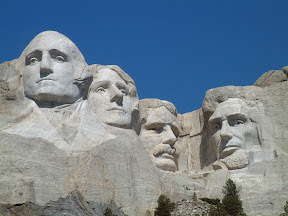 Four Presidents, four scenarios, four outcomes? Of our selection of four Presidents (at least since the 1920s), only FDR and Obama inherited a grave economic crisis. Reagan inherited a growing set of economic problems that would increase later in his term, while Clinton inherited what those of us living through the current crisis would consider to be quite mild. The best performer his first year on the job was FDR, though because of the extraordinary circumstances of the time, FDR’s performance is at once an anomaly and absolutely amazing. Of our group, the most consistent first-year performer was Bill Clinton, scoring an initial good market reception and a good first year number. Reagan comes in last, though much of his performance is due to a double-whammy of inheriting a bad economic situation and solving it by extending some painful changes. Obama’s performance is, of course, unknown, but to say that he is somehow “failed” or that the market has turned against him is wholly inaccurate. If we look at FDR’s early days, the market clearly gave a no confidence vote, but at the end of one year, a the market was obviously happy about something. 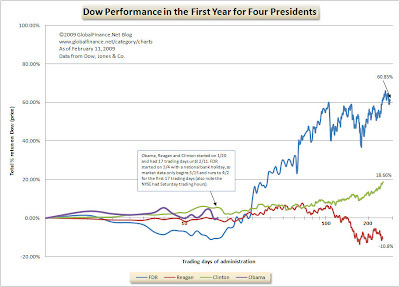 Under Obama’s first 17 trading days the Dow is where it was on January 20 in geometric terms and looking at the numbers, Obama is actually better off than some of our “historic” Presidents.